Works exceptionally well, small but very powerful. None to speak of - a touch more expensive than other models, but the performance makes it worthwhile. Looking to buy a large capacity combi microwave, but don't have much kitchen space? This slimline model from Panasonic may just fit the bill, providing 27 litres of capacity from within it's small frame. Weighing just 13.5kg, and measuring 52cm by 31cm by 39.5cm, it still somehow features a pretty spacious interior with dimensions of 35.9cm by 21.7cm by 35.2cm. If you are interested in a powerful do it all microwave, that will put up with day to day usage and wear and tear, then the NN-CT569MBPQ is definitely worth considering - it is exceptionally well designed. It features 10 different food options - Curry, Chinese, Pasta, Casserole, Fish, Vegetables, Jacket Potatoes, Potato Products, Chicken and Pizza, which should cover a large percentage of daily tasks. All of the controls are well labelled, making this silver microwave oven suitable for both the young and older generations. The grill mode features 1300W of overall power, and the oven provides a temperature range of between 100-220C. Both worked very well, and cooked various dishes beautifully - our testers were impressed. It also features the excellent Chaos defrost facility, which consistently works well on a variety of food types. The main selling feature for us is the overall size - considering the large capacity, this microwave is tiny in comparison to rival manufacturer's models. Overall it looks very smart - and priced at a fair bit under £200, offers pretty good value, especially considering the decent build quality. Overall an exceptional combi microwave - reasonably priced, and very well constructed. 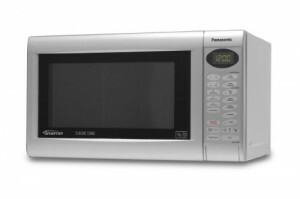 If space is of a premium in your kitchen, and you need a do it all combi microwave, then the Panasonic NN-CT569MBPQ is well worth buying. Is the grill used to heat the oven when the oven is used as scan vector oven or is it a separate function?